Webster's Dictionary contains several definitions for the word "fidelity". The pertinent definition states, "The degree to which an electronic system accurately reproduces the sound or image of its input signal". While musical reproduction is at the heart of the audio equipment industry, how fidelity is achieved is one of the industry's most interesting and entertaining aspects. Since each company markets its own design as being the best way to achieve high fidelity, it is up to the consumer to determine which product actually fulfills the promises made by the manufacturer, and meets the needs of the consumer. While searching through advertising that contains flowery claims of high fidelity bliss, it is clear that there is great competition among manufacturers - some seek the entry level end of the market; some seek the highest level of price and exclusivity. However, it is in the moderate price range that the greatest effort is focused - the level that is expensive enough for high quality parts and construction, but at a price low enough for people of ordinary means to attain without extraordinary financial strain. Into this maelstrom of innovation and corporate rivalry comes BV Audio. BV Audio brings something new - a fresh approach based on an engineering background different from most audio companies. In fact, the engineers at BV Audio used to be in the business of nuclear power plant control and regulation. Attention to detail comes with the territory. The Chief Engineer, Ladislav Bunta, has been working to achieve the stated mission of BV Audio: that is, the creation of equipment that completely and accurately amplifies the input signal. In fact, when referring to the design, their website states, "The result is a sound that won't be immediately appealing to everyone. It is an exact and true reproduction of every recording with all of its details, including possible faults and artists' mistakes as in the real life. That's what our products are all about." BV Audio currently is producing a line of just three products, all solid state, all beautifully designed and exceptionally well built. Two of the three BV Audio products are the subject of this review: the P1 preamplifier, and the PA300 power amplifer. The third in the series is the A300S integrated amplifier, which uses most of the design features and parts from the P1 and PA300 but in an integrated format. What Is the P1 Preamplifier? The P1 is a solid state, 2-channel preamplifier, with five inputs: four line level inputs and a phono stage. It has XLR and RCA input jacks on the first line-level input, a feature that will be much appreciated by users with balanced output CD or SACD equipment. The remaining three inputs use only RCA jacks. A pair of XLR output jacks can be used to connect to BV Audio's own PA300, or to any other power amplifier that has balanced inputs. However, the P1 is also equipped with RCA outputs allowing it to be used with virtually any modern power amp. In addition, the P1 has a set of pass-through, RCA output jacks for the 'tape out' feature. The detachable power cord is located on the back panel. The P1 also is equipped with a single, 1/4-inch plug that connects to the PA300 and allows the user to turn both pieces of equipment on and off with the remote or the preamp controls. All functions are accessible by remote control and through front panel buttons. However, while the remote has a 'standby', or power button, there is no separate power button on the front panel. To power-on the unit, simply press and release an input button; to turn it off, press and hold an input button. The P1 is very simply and attractively designed. It has a fairly standard, 33cm by 44.5cm (13 inches x 17 1/2 inches) footprint. At only 2kg (4.5 pounds), the P1 is very easy to handle when relocating it becomes necessary. The front panel is clean and simple looking with one LCD panel and eight buttons. The finish on the front panel of the sample unit is a very attractive, silver enamel. However, production units will soon be changed to a brushed aluminum finish on the front panel. The remainder of the chassis is painted black. What is the PA300 Power Amplifier? The PA300 is a true, dual-mono, solid state power amplifier with a separate, 300-watt, toroidal power transformer for each channel. The transformers are located in the middle of the chassis and are separated from the amplification circuits, which are located on both sides. The massive heatsinks are located on the two sides of the unit and covered by a vented cover. While not obvious at first, close inspection reveals that the vents on the cover correlate very closely with the heatsink fins. This is one vented cover that will not interfere with proper cooling. While most people believe that Class A operation is necessary to achieve minimum distortion, BV Audio is out to prove them wrong by operating the Motorola output transistors of the PA300 in Class AB. Of course, a huge advantage of Class AB operation is reduction of electricity usage. Despite the rated 110 watts per channel (into 8 ohms), power consumption at idle is in the 30 to 40 watt range. At maximum power, the PA300 can use 500 watts or more. large toroidal power transformers, and heatsinks. The PA300 was designed to visually complement the P1, from the shape and design of the simple front panel, to the black chassis finish. Unlike the P1, the PA300 has no controls on the front panel. Five LEDs are located on the front panel: a single power 'on' light is located in the center of the panel, and one 'peak control' light and one 'protect' light per channel are located on either side of the power light. When the unit is switched on, the power light comes on and stays on; the remaining lights flash on, then turn off. The peak control and protect lights only light during use when peak power is demanded of, or exceeded by the amp. The power switch is located on the back panel, along with a switch to select manual or remote power switching capability. A 1/4-inch plug on the back panel is used to connect to the P1 for remote power switching. One pair of XLR input jacks per channel is located on the rear panel. A pair of "link output" XLR jacks per channel are located next to the inputs, for use when bi-amping. Two pairs of speaker jacks are provided for each channel, allowing easy bi-wiring. The detachable power cord is located on the back panel. The footprint dimensions are nearly identical to the P1, being only 3 cm (1 1/4 inches) deeper. However, owing largely to the massive power transformers, the PA300 weighs in at 14.1kg (31 pounds) and takes somewhat more effort to move around than does the P1. BV Audio recommends the PA300 can be used with any loudspeakers of 4 ohm or greater impedance; they do not recommend the use of electrostatic loudspeakers because of their characteristic very low impedance, high current draw, and the possibility of overheating the PA300. Front of silver PA300, Power LED in center, "peak control"
and "protect" LEDs for each channel on each side of the power LED. True to the stated intent of BV Audio, the P1 and PA300 do a marvelous job of accurate audio reproduction. For example, with the BV Audio components, there is no smearing of the line between CD and LP. The input signals are so accurately reproduced that the differences between vinyl and Red Book Compact Discs are very clear. The P1 and PA300 quickly point out flaws in the digital medium, delivering audio sound that can be slightly abrasive and gritty, and often comes across as a little cold and brittle. Of course, these results were obtained with a moderately-priced CD-player - your results will vary. However, LPs played through this equipment have wonderful clarity and sound smooth and musically involving. Sometimes, accuracy of signal reproduction can work against you. While the CD-player I used with the P1 and PA300, a nOrh CD-1, is generally smooth but very detailed and has a relatively musical output, harsh and grainy sound was obvious with many CD recordings. Only the best recorded CDs sounded good - poorly recorded CDs sounded less than pleasant. Considering that the CD-1 is not in the same class as some of the more exclusive and expensive players available, it seems likely that a different CD-player would work better with the P1 and PA300 than does the CD-1. Perhaps a higher quality, outboard DAC is all that would be necessary to substantially improve the sound of CDs. Caution: this is not the preamp/amp combination to use with low-cost, consumer-grade CD-players. Switching to DVD-V format discs from HiRes Music, the sound from the BV Audio combination was beautifully detailed, smooth, clear, and, most importantly, pleasant. Based on their performance with DVD-V format, the P1 and PA300 should work exceptionally well with SACD and DVD-A, delivering all the detail and musical sound promised by these high-resolution formats. The P1 has XLR and RCA outputs, allowing it to be used with a variety of power amplifiers. Three other power amplifiers were used to find out how well the P1 worked with them. The BV Audio P1 retained its clarity and high resolution regardless of which amplifier it was driving. The singular most outstanding feature of the P1 seems to be its ability to remain almost completely transparent in use - there was no obvious coloration or alteration of the sound by this preamp. To confirm the neutral presentation of the P1, the CD-1 was connected directly to a Decware SE84C-S power amp, which has a gain control knob and can be used without a preamp. After listening to selected music, the P1 was then connected between the CD-1 and the SE84C-S. There was no apparent difference in clarity, detail, or tonal neutrality. However, the dynamics were somewhat improved by the active preamp. In short, the P1 has clean, clear, and neutral output with an absolutely silent, 'black' background. It does what a preamplifier should, it gets completely out of the way of the source. The detailed and accurate output is excellent with DVDs and LPs allowing minute, recorded sounds to be passed along to the amplifier and speakers, without apparent alteration or veiling. The P1 provides sufficient line-level gain of the input signal without veiling musical detail. From bass transients that are clean and quick all the way through high frequency notes that are sharp and clear, this preamplifier does not impede the information carried on the input signal. Bass extension is also very good, at least observed within the limits of my reference system. A phono stage is a welcome addition to any preamp, particularly a sub-$2000 unit. Beyond the mere inclusion of LP capability is that the P1 phono stage has very good sound quality. Even more appreciated is that it is adjustable with selective gain and custom impedance load options allowing it to be tuned for use with moving magnet or moving coil cartridges. Prior to delivery of the unit for review, BV Audio set up the P1 to work with my Dynavector DV20X. The phono stage has great detail, smooth, clean highs, and slightly forward, but clear and natural mids. It provides exceptional holographic imaging. Bass detail is very good. Using a direct comparison between the inboard phono stage and a Creek Audio OBH-8SE on another line level input, the BV Audio phono stage was clearly superior. It sounded more neutral, with superior treble clarity, and slightly better detail and imaging than the Creek. The OBH-8SE had somewhat better bass extension, but could not match the other qualities of the inboard BV Audio phono stage. One of the highlights of the P1 is precise, 3-dimensional imaging. While this aspect of its performance is very clear with many recordings, from the spatial effects of Peter Gabriel's So LP, to the chamber music of Stefania de Kenessey, one of the best recordings for demonstration purposes is the Peace Pipes LP by Arco Iris. The P1 provided precise and unwavering instrument locations, not only left to right, but front to back as well. This superb imaging held true whether the P1 controlled the PA300, or any other power amps that were used. Of course, 3-dimensional imaging has been overly hyped and has little to do with musical quality, but it certainly can be used to enhance a listening experience. 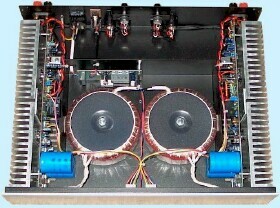 In the case of the P1, stereo imaging is a bonus added to the other fine qualities of this preamp. The remote control is quite easy to use. It is small and has only a few buttons. Numbered buttons select the input. Up and down arrows change the volume, balance, and 'sensibility'. The ever-popular 'mute' has its own button. A memory button commits settings to memory so they remain constant. In fact, once the parameters are set in memory, they remain even if power is cut from unit by unplugging it. The sensibility (which will be renamed 'sensitivity' on future production) is a very handy feature that allows the levels of the inputs to be matched and set to memory. This helps prevent accidently blasting innocent bystanders out of the room when inputs are switched. Another convenience of the P1 is that each input can be renamed, allowing the user to customize the unit further. The PA300 delivers easy power that becomes obvious when music is the most demanding. Rated at 110wpc, the PA300 powered any speakers tried with such ease that it provided more than adequate headroom with any type of music. On cut No. 3 from the Gladiator movie soundtrack, low powered amps clip easily, even at moderate volume, because they are unable to deliver sufficient power to get through the passage. The PA300 breezed by this passage with no difficulty at all, rendering every note, every detail clearly and audibly. In fact, when playing Beethoven or Mahler through a pair of nOrh SM6.9 loudspeakers (a rather demanding speaker that is rated up to 300 watts and combines moderate sensitivity with a very complex, power-dissipating crossover), the PA300 could deliver as much power as suited the listeners, while never missing a beat, or smearing a note. The power that allowed symphonic music to be rendered with clarity and detail also allowed rock music to be delivered with driving force. The PA300 didn't miss a beat. From the manic, over-the-edge, original rendition of Eric Clapton's Layla to the savagely satyrical Money for Nothing by Dire Straights, the PA300 reproduces rock music effortlessly. While it is likely the PA300 could be forced to clip with the nOrhs, clipping was never observed, even at sound pressure levels that were quite outrageous - and yes, this combination will shake the walls! The ample, easy power of the PA300 combined with appropriate speakers will provide a visceral listening experience with a tremendously satisfying, dynamic sound that can be felt as well as heard. and two sets of speaker outputs. In all instances, bass was quick and well-controlled. This is expected of solid state amplifiers, but it is not always delivered. Some designers of modern amplifiers seem to accentuate the low frequency output to cater to the desires of people who believe that thunderous, pounding bass defines music. While the PA300 has the power to deliver such bass, it does not degrade or distort the signal, but delivers it, intact, to the loudspeakers. Clean, strong bass was never an issue with the PA300, but there was one combination of amp and loudspeaker that stood out as amazingly detailed, with quick, clean bass transients that were unmatched by any of the more 'appropriate' loudspeakers. The Moth Audio Cicada, a single-driver, full-range loudspeaker designed for low-powered tube equipment, provided the perfect example of clean bass that the other available speakers could not quite match. No tube amplifier on hand could match the low end performance of the PA300 with the Cicadas (or with any other speakers). Unfortunately, the Cicada also has a high-frequency 'tizz' that was tolerable with 2 wpc, 45-powered tube amps, but was accentuated by the BV Audio equipment. That aural flaw, and the limited power handling capability, make the PA300 and the Moth Audio speakers a poor match. Beyond the superb bass, the entire frequency range of the PA300 was neutral, fast, and very detailed. Mids and highs were clean, clear, and non-fatiguing. Most importantly, the grainy sound that is often apparent with medium-priced solid state gear was not apparent. The soundstage was wide and deep, though it seemed to be generally located somewhere behind the speakers. Holographic imaging was excellent, allowing musical sources, whether vocal or instrumental, to be easily located in three dimensions, as long as the recording was good enough to provide that information. With the speakers available at the time of this review, the best synergistic combination with the BV Audio PA300 seemed to be a pair of JM Reynaud Twin Mark II monitors (at least for my favorite types of music). While the Reynauds could match neither the low-end extension of the nOrhs, nor the speed of the Cicadas, they weren't far off on either count, and, with the PA300, provided the best tonal balance of all. The shear musicality of the Reynauds was delivered with grace and power. No matter how hard the PA300 was pushed, it always ran cool, feeling barely warm to the touch. This can be attributed to two aspects of its design: first, it runs in Class AB, which keeps it from converting excessive amounts of electricity into heat; and second, the design incorporates enormous, vented heatsinks on both sides. Of course, it should be noted that in this evaluation, the PA300 was not pushed to its power limit. It will likely run warmer when combined with low-efficiency loudspeakers, in a large room, and at high volume. The first 'negative' observation is not actually a problem with the BV Audio components, but rather can be a problem with anything attached to them. The combination of the P1 and PA300 is brutally revealing - any source, recording, or front end component that is not up to the task will be highlighted, and, in a sense, ridiculed by sharp and clear reproduction of all signals and defects, whether from bad recordings or system shortcomings. If the source is clean and clear, the output also will be clean and clear; if the source has the least bit of harshness, the harshness will be amplified. While LPs sounded as smooth, clear, and sweet as they should, Red Book CDs fell somewhat short. In the glare of true, high-fidelity reproduction, the digital shortcomings of Red Book CDs are spotlighted. It also becomes clear that a sub-$1000 CD-player is not capable of smoothing out the problems inherent in this format. These aural inadequacies certainly cannot be blamed on the P1 and PA300, but potential purchasers must be prepared for the possible need to upgrade equipment. A properly selected, high quality CD-player or DAC should give superior results. A minor complaint deals with low volume performance. When volume is lowered to very soft levels, for instance late at night when other household members are asleep, the low and high ends of the frequency spectrum become subdued and difficult to hear. This is a common characteristic with most audio gear, but is not entirely the fault of the equipment. Human audio perception at the ends of the frequency spectrum falls off at low volume. In the distant past, cheap audio equipment could not compensate for this auditory deficiency, and high-end equipment had loudness contours that allowed the listener to boost the high and low ends of the spectrum to compensate for this perceived loss. Since any additional signal processing can easily degrade the purity of the audio signal, this type of signal enhancement has fallen out of favor in the past two decades. Such conveniences, welcome or not, are generally not available in high quality audio equipment. While there is no loudness contour to fix this minor problem, it takes only a small boost in volume with the BV Audio components to bring back the far ends of the spectrum to a perceivable level. In addition, no detail seems to be lost at low volume. Another minor complaint is that the PA300 has only XLR inputs. This is not a problem if the purchaser is going to use the P1. However, the lack of RCA inputs limits the variety of preamps that can be used. Of course, it could be argued that the P1 and PA300 have great synergy, and that they should be purchased together. Based on my experience during this evaluation, I would so argue. The BV Audio P1 and PA300 represent true high-fidelity by adhering to the concept that signal gain is the only alteration that amplifiers should apply to a musical signal. This engineering premise, combined with excellent build quality, results in a pair of audio products that use clarity and high resolution to great effect. When combined with high quality, compatible sources and loudspeakers, the BV Audio equipment is very satisfying, and clearly represents what can be achieved for a moderate sum of money. As with any high-end audio equipment, the very high fidelity signal amplification demands that the source be at least as good as the preamp and amp. This is somewhat difficult to do with standard CDs, as they tend to sound grainy, bright, and brittle. All the flaws of the recording and medium are amplified and thrown at the listener. While this was a serious problem with mediocre CDs on my equipment, it was less of a problem with well-recorded CDs. Playing DVD format music was particularly gratifying because it demonstrated what can be done with digital recording and points the way to high-resolution, digital formats. In the end, the P1 and PA300 are only as musical as the source. While they usually worked acceptably well with the nOrh CD-1, they worked very well with DVD-V format music. However, to really appreciate the musical potential of the P1 and PA300, LPs were required. The aural qualities of the Dynavector DV20X cartridge were highlighted by the exceptional clarity, brilliant transients, and clean bass that are hallmarks of the P1 and PA300. The BV Audio P1 and PA300 are capable of noticeably higher fidelity than most comparably-priced products. As such, a potential consumer needs to be aware that purchase of the BV Audio equipment may lead to higher costs later as previously acceptable components are discarded in favor of superior quality equipment that is a better suited to the high resolution of this equipment. Of course, the purchase of the P1 and PA300 would indicate that the purchaser is inclined to do so anyway. In the price range of the BV Audio components, consumers must make the choice between equipment that has many features, and equipment that has superior sound. The P1 and PA300 have very few 'consumer convenience' features, instead placing the engineering emphasis on sound reproduction quality. The P1 is easy to use, quiet, and doesn't interfere with the source input. The PA300 has clean, easy power that will allow the use of almost any loudspeaker in a normal listening environment. Together, they have a well-appreciated synergy that fulfills the BV Audio promise of true, high-fidelity. After working with the P1 and PA300, I look forward with great anticipation to future products from BV Audio. Meanwhile, if you desire a preamplifier and power amplifier that do not color or alter the source signal, that do not add character of their own, and you do not wish to mortgage your house to purchase your preamp and power amp, contact BV Audio - they have a selection of amplifiers that may very well suit your needs. Our goal was to design an amplifier that is priced far below the competition, knowing that there are music enthusiasts who don't have $10,000 for an amplifier. We believe that there is a group of people who demand precise and true HiFi sound reproduction without any coloration or maskings. If you belong to this kind of group, and you don't want to shell out a lot of money, then don't hesitate to contact us. Photographs used in this review courtesy of BV Audio. Many thanks to Mr. Stepansky and everyone else involved for providing the units used in this review.